4. In areas with low turbidity. Deeper corals might be mentioned, but they are rarely discussed to any detail. Thomas Jundt, from the International Coral Reef Information Network website http://www.coralreef.org . A shallow water coral reef in the Red Sea. Before I go into the true distribution of corals, I will go over a bit of coral taxonomy. “Coral” is a general term used to describe several different groups of animals in the Phylum Cnidaria. These animals have “the presence of skeletal material that is embedded in the living tissue or encloses the animal altogether” (NOAA’s CoRIS glossary http://www.coris.noaa.gov/glossary/glossary_a_k.html#c ). The following is a summary of current Cnidarian taxonomy, showing the primary groups containing animals referred to as “corals”. As you can see, “coral” is a fairly general term. This image from Hawaii shows a variety of species of octocorals. Shallow-water scleractinians of the genus Acropora . A deep-sea Antipatharian from Hawaii in the genus Leiopathes . Black corals are easy to identify because their black skeleton is usually showing near the base. A zoanthid in the genus Gerardia. Gerardia sp. is one of the more abundant deep-water coral species in Hawaii. Cnidarian taxonomy is frequently updated with developments in genetic research. You may want to check the Tree of Life website for changes and for more general information on corals and anemones. This website is most up-to date for the subclass Hexacorallia. A stylasterid coral, Disticophora anceps , from Hawaii. The corals most people are familiar with, the ones that form reefs, are primarily scleractinian corals (hard corals). 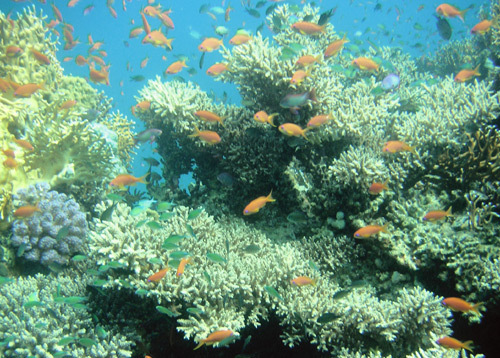 Coral reefs are formed primarily from the skeletons of hard corals and calcareous algae. Scleractinian corals in shallow water often have symbiotic algae associated with them called zooxanthellae (zoe-xan-thel-lee). The zooxanthellae contribute to the nutrition of the corals and to the growth of the calcium carbonate skeletons of the corals. Corals which contain zooxanthellae are referred to as “zooxanthellate” and those without zooxanthellae are referred to as “azooxanthellate”. There are many shallow-water octocorals that are also zooxanthellate. Corals that occur below the photic zone are all azooxanthellate as are many cold-water corals. Scleractinians are a very diverse groups of corals. There are currently about 109 genera containing 656 species of zooxanthellate scleractinians that occur in shallow water. There are 117 genera containing 669 species of azooxanthellate scleractinians. So, there are more species of cold and deep-water scleractinians, than the well-publicized shallow-tropical corals! And new species of azooxanthellate corals are being discovered at a faster rate than zooxanthellate corals are. Other groups which have been tallied are the calcified hydrozoans, with about 260 species, and the Antipatharians (black corals) with about 150 species. Antipatharians are almost entirely found in the deep-sea. New species of Antipatharians are also being discovered quite frequently with increased deep-sea explorations. Octocoral species have not been tallied, but there are currently 44 families. A diverse group of octocorals and zoanthids on Cross Seamount in Hawaii. Instead of the tropical distribution most people think of for corals, corals are in fact distributed worldwide, from the Arctic to the Antarctic and to depths of at least 6000m. Most corals are found in areas of hard substrate with high current flow. 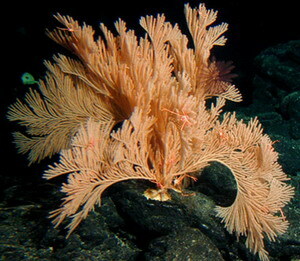 Cold-water and deep-sea corals have been studied in Alaska, Australia, New Zealand, Hawaii, Nova Scotia, the Mediterranean, the Caribbean, off Norway and Sweden, and around the United Kingdom. 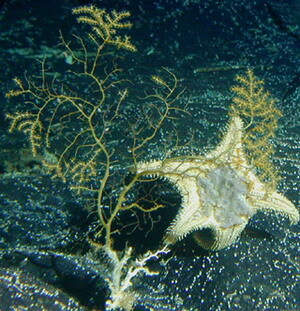 Some of the deep-sea scleractinians have also been shown to form large reef structures with diverse communities of associated invertebrates, similar to shallow-water coral reefs. 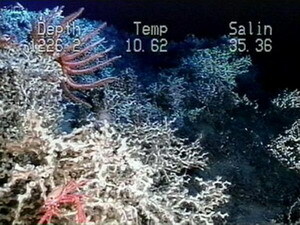 These reefs have been discovered in deep water off Norway ( http://www.imr.no/coral )and Sweden, and other areas of the North Atlantic. They have also been found off Brazil, in the Gulf of Mexico, off Florida on the Blake Plateau, along the Mid-Atlantic Ridge, off South Africa, and on seamounts in New Zealand. In the Atlantic, the primary reef-forming species is Lophelia pertusa . In New Zealand the species are Goniocorella dumosa and Desmophyllium cristaglii. These deep reefs are large enough to be detected using sonar imaging of the sea floor. A Lophelia pertusa reef from the Gulf of Maxico. 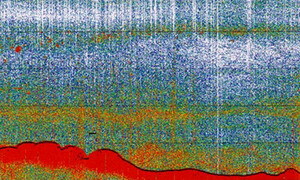 Sonar image showing Lophelia pertusa reef. 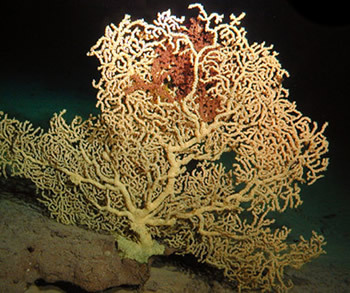 Octocorals do not form reef structures, but have been found to occur in high-density coral gardens in certain areas of Hawaii and Alaska, particularly on summit areas of seamounts. Undoubtedly high-density octocoral areas are also widely distributed, but they can only be found by exploring with submersible or ROV technology, not with sonar. NOAA OE Gulf of Alaska 2004 expedition team. 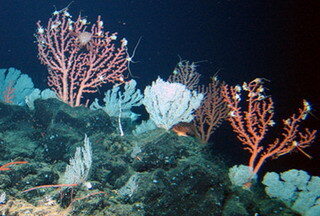 This image (above) shows a diverse community of octocorals near the summit of an Alaskan Seamount. Corals in the families Paragorgiidae, Primnoidae and Paramuriceidae are present. Note the abundant invertebrates in the coral trees. A dense community of octocorals, primarily in the family Isididae (Bamboo corals), on a steep ridge of a Hawaiian Seamount. 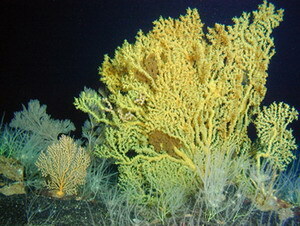 Deep-sea corals come in many growth forms. Some are reef-forming like the scleractinians. Others are arborescent (tree shaped) and look like the familiar shallow-water sea fans. Some form planar structures that can be several meters tall, while others form more bushy colonies. Still other corals form unbranched whip-like colonies. These include octocorals and Antipatharians. Finally, some scleractinian corals are solitary, with a single large polyp. A Primnoid octocoral in the genus Calyptrophora . Species in this genus may be bushy or planar. 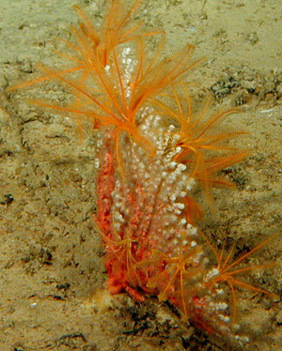 A Bamboo octocoral, Lepidisis olapa . 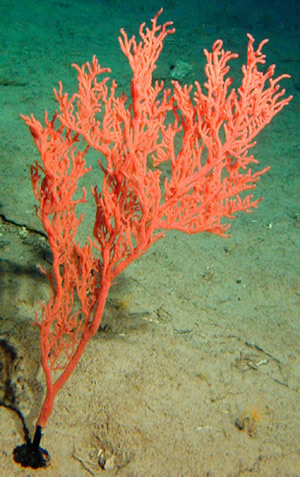 Corals in this genus are not branching. 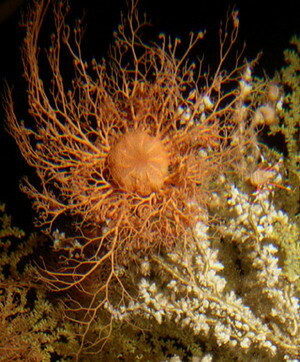 This image (above) shows an octocoral in the genus Paragorgia , and a Zoanthid in the genus Gerardia . Both types of corals have adapted an arborescent form. Arborescent corals include many of the octocorals, but particularly in Hawaii, most groups of corals have representatives that take on this shape, including scleractinians in the Family Dendrophyllidae, many Antipatharians, several zoanthids, and the stylasterid hydrocorals. Clearly there is some adaptive advantage to this growth form for so many groups to be using it. Young colonies of Gerardia sp. and Corallium secundum (above). Scientists have found that Gerardia may live for more than 3000 yrs, while Corallium may live for several hundred years. Growth rates vary by coral species, but generally are extremely slow and the corals live to be very old. Growth rates have been measured primarily in arborescent-type corals and are generally in the range of only a few millimeters per year. 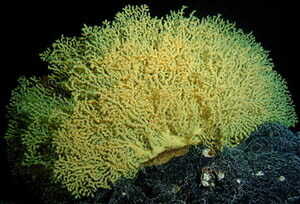 Colony ages of 100’s to even 1000’s of years are not uncommon for deep-sea corals. 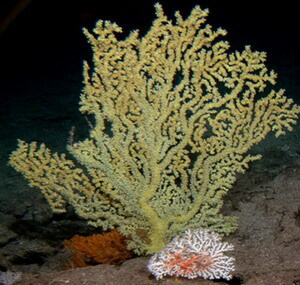 Deep-sea corals are usually found in areas with strong currents on hard substrates with low sediment cover, generally on topographic highs – peaks of seamounts, tops of walls, knobs and pinnacles, etc. The current functions to remove sediment and to bring food. Deep-sea corals are feed by suspension feeding, so the more water that passes by them, the more food they will obtain. Currents have been measured as high as 100cm/sec in some coral areas. I have been in the submersible in currents that were so strong we had to go with them because the sub wasn’t strong enough to make headway or even hold position going into them. These areas had the nicest corals beds I have observed. A dense community of octocorals in a high current flow area of a steep ridge of a seamount in the Northwestern Hawaiian Islands. In some areas, the coral community was so dense, we could not see the underlying substrate. 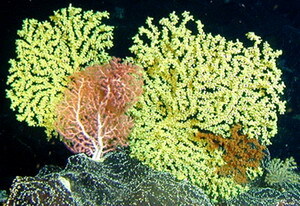 Deep-sea corals have been studied primarily on seamounts, where they are one of the dominant taxa. Seamounts are mountains that rise up from the seafloor. They vary in vertical relief, shape, size, and depth of the peak below the sea surface. Some seamounts are flat-topped, sort of like a terrestrial butte, and others are pointy. They have rough terrain, steep walls, and deep valleys, very similar to terrestrial mountains. There are literally 1000’s of seamounts throughout the world’s oceans in all shapes and sizes. Many oceanic islands, like the Hawaiian Islands and other Islands of the Pacific, are really just seamounts that reach the ocean surface. Measured from the seafloor to its summit, the Big Island of Hawaii is actually taller than Mount Everest! 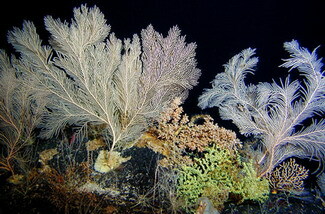 Much of the fauna of the slopes of oceanic islands, including deep-sea corals, is very similar to seamount fauna. 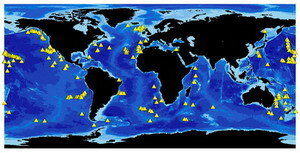 This map shows the distribution of some seamounts that have been sampled around the world. Many of these sites were sampled only with cameras or video. The number of seamounts that have been sampled is a tiny fraction of the total number of seamounts in the world’s oceans. Very little is known about the reproductive biology and dispersal ability of deep-sea corals. The first studies of deep-sea coral reproductive biology were on two species in Hawaii and one species in the Mediterranean. One species of Hawaiian black coral, and the Mediterranean red coral, Corallium rubrum , have been shown to have larvae that actively swim away from light. The Hawaiian corals had separate sexes with external fertilization and did not reach reproductive maturity until age 12-20 years. The Mediterranean coral had internal fertilization and broods its larvae. Genetic studies of the Mediterranean corals showed that it had some genetic isolation, even between populations that were close together. 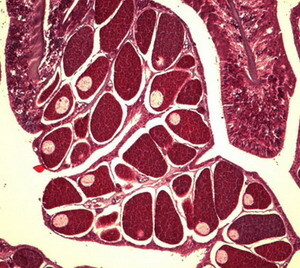 A cross section of a Gerardia sp. polyp showing large eggs. Seamounts and islands have specialized water circulation known as Taylor Columns and Taylor Cells. Currents flowing past these features get entrained and may cause circular flow patterns around the seamounts or islands, or over the tops of the seamounts. These flow patterns may cause larvae to be retained over or around the seamounts or islands, causing some isolation between features. Studies of general seamount fauna in the Northeast Pacific have shown that many of the fauna have only short-distance dispersal capabilities, which would also contribute to reproductive isolation. Finally, studies of seamounts communities in the South Pacific have shown that seamounts have high levels of endemicity, meaning that a given species is found on only one seamount, and not on the surrounding seamounts, seafloor, or continental slopes. If seamount and island populations are as isolated as these studies suggests, then they will be very vulnerable to disturbances. 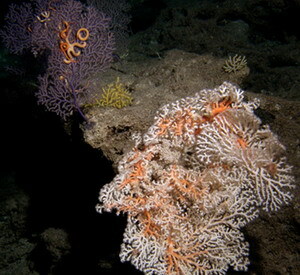 Most deep-sea corals have diverse invertebrate communities associated with them. Corals add habitat complexity to an otherwise flat seafloor, providing many hiding places for small or juvenile animals. Many of these invertebrates are also suspension feeder like the corals. They climb up to the tops of the coral branches to get higher into the water column for feeding. Occassionally, seastars and urchins are found in the corals, eating the coral soft tissue away from the skeletons. Some polychaetes and small crustaceans seem to be either parasites or have a symbiotic relationship with the corals. The corals, especially Corallium corals, often grow their skeletons over the tubes of their associated polychaetes. One study of Lophelia pertusa reefs off Norway found invertebrate diversity levels comparable to diversity found on shallow water coral reefs. Besides this study, there had been few investigations into the invertebrate communities associated with the corals, but several were undertaken, including in Hawaii, over this last cruise season. A large basket star on a colony of Gerardia sp. in Hawaii. A seastar with its gut everted, consuming the soft tissue of an octocoral. 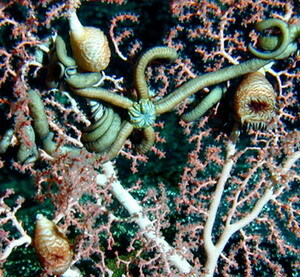 Many species of invertebrates live on deep-sea corals, shown here are anemones and an unbranched basket star in the genus Asteroschema . During our recent visit to one site in Hawaii, we found thousands of crinoids in the coral bed, most of them were on the tops of coral colonies, as shown here. Hawaii has about 37 species of shallow-water hexacorals and 1 rare gorgonian octocoral (2 if you count a recent invasive gorgonian octocoral), buts its true coral diversity lies in deeper water. 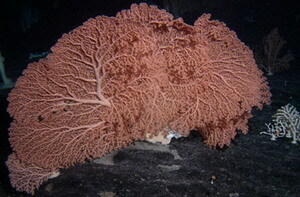 Over 93 species of gorgonian octocorals and 54 species of deep scleractinians are known from the Hawaiian Archipelago. Very little of the deep-sea around Hawaii has been explored and every research expedition is yielding large numbers of new species. Probably the most abundant of Hawaii’s corals are the precious corals. Precious corals are corals that are often harvested and their skeletons are carved to make jewelry. The main species of precious corals in Hawaii are 2 octocorals Corallium lauuense and Corallium secundum , and a zoanthid in the genus Gerardia . These three species occur at depths of 300-500 m on islands and seamounts throughout the Archipelago and into the Emperor Seamount Chain. There is also an Antipatharian used for black coral jewelry. The red coral, Corallium lauuense, from Hawaii. It has a more limited range in the Main Islands and occurs at depths as shallow as 150 feet. The three deeper species of precious coral species are often found in large “beds” with high concentrations and abundances. Sometimes all three species are present, other places only one or two. Usually these areas also have a high diversity and abundance of other octocorals and associated invertebrates. In the foreground is the pink coral, Corallium secundum , from Hawaii. The gold coral, Gerardia sp., from Hawaii. In Hawaii below 500m, the suite of coral species changes. 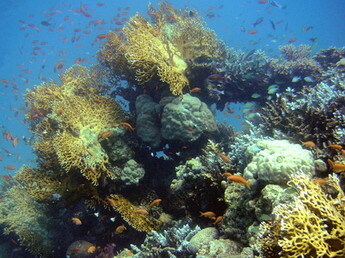 The corals are also abundant and diverse, but are more spread out. They are found in most areas where hard substrates are present. I have only observed a few concentrated beds of corals, along with large sponges, at depths below 500m, these were in areas of extremely strong currents. There are likely to be a number of deeper coral beds throughout Hawaii, but we have spent very little time at those depths up to this point. There are a number of uses for deep-sea corals. As mentioned above, the precious corals have been harvested for jewelry. This tradition began in the Mediterranean as early as 25,000 BC. It continues today primarily in Asia. The main species used in this industry are red and pink corals in the genus Corallium , the gold coral Gerardia sp., and some Bamboo corals. The soft tissue is removed from the skeleton and the skeleton is then carved in to jewelry or figurines. I have even seen small statues of animals and pagodas made from pieces of deep-sea corals. Coral harvesting was once very active in Hawaii and in the Emperor Seamounts. With increase regulations, it has been almost eliminated in the Main Hawaiian Islands since the 1970s. The Emperor Seamounts are in international waters, so do not benefit from state or federal regulations. 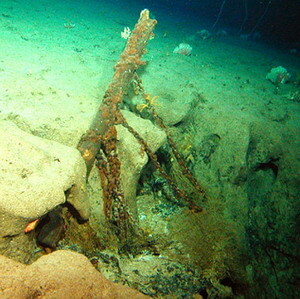 These Emperor Seamount beds and beds in other parts of the Pacific have been significantly overharvested. A tiger for sale in a shop window in Okinawa. It is made from skeletons of the coral shown in the display with it. 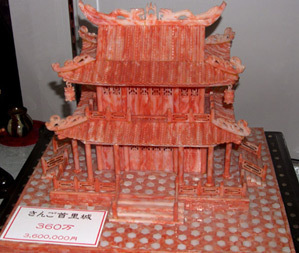 A pagoda made from the skeletons of precious corals, from a shop in Okinawa. Corals are also useful for science. Because they live over many centuries, their skeletons may provide paleoceanographic information. This information can even be extracted from skeletons of corals that have been dead for a period of time. Because seamounts seem to be isolated, and corals are one of the more abundant fauna, they also make a good target group to study processes of speciation in the deep-sea. As shallow-water stocks of many fisheries decline, fisherpeople are dragging their nets in deeper waters. Many seamounts and other areas of the seafloor, including areas around Alaska, and areas of reef off Norway and the United Kingdom, are being scraped clean by trawl nets. Trawl nets are basically giant nets with large weights in front of them. The weights move in front of the net as it is dragged on the seafloor, bashing every coral and sponge and other invertebrate in their path. This scares the fish off the bottom and into the net, and picks up all the other seafloor fauna. One of the highest impact fisheries is the Orange Roughy fishery in New Zealand and parts of the South Pacific and Indian Oceans. Coral bycatch for these fish sometimes outweighs the fish caught! Another fishery is the Patagonian toothfish fishery off Chile and part of South America. In addition to being destructive to the corals, which may in fact be an essential part of the fishes’ habitat, deep-sea fishes are also very fragile and slow-growing. The fisheries for the fish species are outcatching the rate at which the fish can reproduce and replace themselves. When this happens, the fisheries simply move onto another species, and the process begins over again. A colony of Gerardia sp. (above) on Cross Seamount in Hawaii. 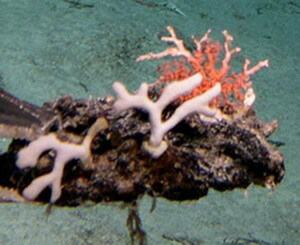 This is a very healthy coral, but we observed many damaged or knocked –down corals on Cross Seamount. The damage appeared to be caused by pelagic long-lines that had drifted over the seamount and became entangled in the corals. In Hawaii in the 1960’s and 1970’s, there was a large trawl fishery for Pelagic Armourhead in the Northwestern Hawaiian Islands. I have dived in a submersible on one of the more impacted seamounts. We found some nice coral beds with vast areas of coral stumps through them. Although the fishery ended over 30 years ago (when the fish stock was depleted), there were still no corals that had been able to recolonize the trawled areas. The good news is some of these areas are now Marine Protected Areas, including portions of the Norway reefs, a group of seamounts off Tasmania, large areas of Fiordland in New Zealand, and most of the islands of the Northwestern Hawaiian Islands. Unfortunately though, most deep-sea corals and seamounts lie in international waters, meaning an international effort will be required for their protection from trawling damage. For those who like seafood, a list compiled by the Monterey Bay Aquarium, of seafood that is farmed or harvested in environmentally friendly ways. Black corals have continued to be harvested in Hawaii because they occur at the lower limit of SCUBA depths. 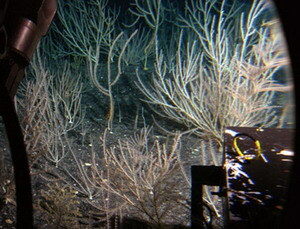 The deeper species require a submersible or ROV for selective harvesting. Because of the high cost of these vehicles, the coral fishery in Hawaii went out of business in the 1970’s. One group attempted to restart the red, pink and gold fishery in 1998, but although some of the red corals they collected sold for $880 per kg, they found it was not a cost-effective business. Precious corals used to be collected using tangle nets. In this image (above) is an old tangle net we found in a coral bed off the island of Oahu. The heavy bar and chains were used to break up the corals and a net was attached to the chains to collect all the pieces. As you can imagine, this was very destructive to the coral beds. In Hawaii, black coral beds are being heavily impacted by an invasive octocoral species – Carijoa riisei . This species has been spreading quickly throughout the Islands, in shallow water and down through black coral depths. Scientists have found that they are overgrowing many of the black coral colonies in the commercially harvested beds. This invasive species grows over the black corals, killing the black coral tissue. They also cover most of the hard substrate habitat, leaving nowhere for new colonies of black corals to grow. 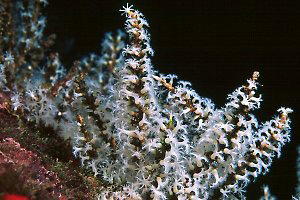 The snowflake coral, Carijoa riisei , is an invasive species that is taking over black coral habitat in Hawaii. 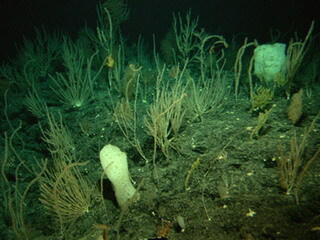 Several of the deep-sea coral reefs, In Norway and other areas, are located near oil deposits. These reefs can be easily destroyed by laying of pipes or putting up oil platforms. In Norway, and in the Gulf of Mexico, the oil industry is now trying to work together with scientists to minimize impacts. A small ridge of Primnoid corals in the genus Narella .